When setting times for league and tournament draws, it is easy to decide the best time to schedule a game because all the information related to that match is displayed on the same screen. Conflicting times slots are color coded based on division's earlier and later rounds, and other division possible conflicts, if participants are allowed to play in multiple divisions. No matter which types of tournament draws are being used, there are check boxes and clock icons next to each match when viewing the bracket. These will disappear on the printable bracket. Select the matches from the brackets, from the grids, or other scheduling pages and after selecting, this screen will come up. When setting multiple matches, if there are more matches to set than time slots at any given time, the scheduler will automatically keep pushing the matches down to the next time slot. 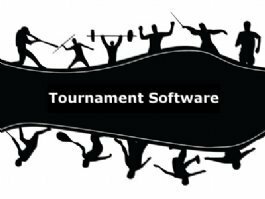 The tournament planner grid lists all the scheduled matches at a specific location for that day. The division code is an abbreviation for the division and will have a match number at the end which is also shown next to that match on the bracket. It will be green in color and the link takes you to view the tournament draws. The round name is also linked to reset that match time. The screen shot shows an example of scheduling a match in a gold division where the loser drops down to a separate drop-down division. On the left side at the top, the divisions and round numbers about to be scheduled are listed, and if a time was previously set it will list the old time. In this case, the match is already scheduled on Tuesday at 2:00 pm, which is color coded as the green match on the grid. To Un-scheduled the match, click the Unschedule Match(s) link and then confirm. To schedule this match at a new time, first select a date / location from the drop down and the page will load the grid. Schedule a new time by clicking on the clock icon inside the desired time slot. Use the match scheduling message along with the color codes in the grid to determine the best time to schedule the match. It is easy to tell the best time to schedule a match, the colors make scheduling simple with one main rule to follow: Always schedule on white rows and you will stay conflict free. Which exact white row you pick should depend on how much rest you prefer to give participants between games. A time slot with a gray background indicates it has no conflict with the current match being scheduled. The match scheduling messages will indicate why certain time periods are blocked out. The MAG10 round of 16 (pink match on the grid at 9 am) must be played before the quarter final match being scheduled. Because of this, all times before 10 am are red and blocked from scheduling an accidental conflict. The light blue matches at 2 pm are matches scheduled in the same round as the one currently being scheduled and do not conflict. Participants in 2 or more divisions can have possible conflicts in later rounds depending on if they win or lose. These type of conflicts show up in orange on the grid, like the one at 4 pm. The 4 pm time slot is red to indicate the conflict, but the system still allows the director to schedule the match at that time. At 5pm there is a light orange match which indicates that there is a drop down match from the main draw but it doesn't affect scheduling the current match. Time slots from 5 pm to 6 pm are highlighted in yellow. This means that during registration, a participant had a personal time conflict and requested not to play during a certain time range. The director still has the ability to override this request and schedule the match during this time period if necessary. No matches can be scheduled after 7 pm which is indicated in red, the clock icons are hidden and the director doesn't have an option to schedule matches after that time. This is because the semi final (purple match at 7pm) which comes after the quarter final match being scheduled is set already, so the match currently being scheduled must be finished before the semi finals starts. On the left below the light blue section, it lists all the possible match participants and all their possible matches and times if they keep winning. When a player has a personal time scheduling conflict, it will be listed next to his name. Clicking on the green linked division name will allow you to view the bracket, and clicking on the blue linked round name will allow you to change the time of that specific game.